As a sales manager, your focus must rest largely on your sales reps rather than your customer. You must win your sales reps over in order to get them to perform at their peak. Do that asking great sales coaching questions and building strong relationships. 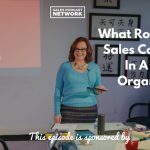 On today’s episode, we’ll discuss how to help your sales team perform to the best of its abilities. 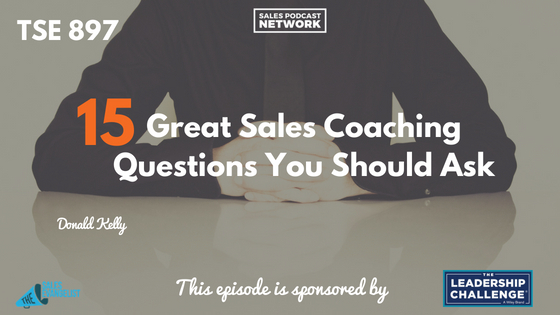 We’ll cover 15 great sales coaching questions you should ask. 1. Which part of the sales process is most challenging? If you’re setting a lot of appointments but not a lot of demos, something is falling short in your process. Maybe you aren’t building value. If I can sit down with a sales rep and discover where the issues are, you’ll help your sales rep perform better. A leader knows what inspires his team. If you aren’t sure, ask. 3. What are the specifics of this particular deal? Seek the specifics of every deal. Find out the challenges and the criteria in order to find out how great the deal really is. If you train your sales team to seek specifics, they’ll learn early to ask the important questions. 4. What have you tried so far? When a sales rep comes to you with a challenge, don’t get into the habit of solving their problems for them. Don’t give him the answers. Help him solve the problem himself and teach him to be a problem solver. 5. Why do you think that didn’t work? Teach your sales reps how to evaluate a problem and determine why the solution didn’t work. Don’t let them just walk away from a failed attempt. Determine what went wrong. 6. What led to that assumption? If your seller is assuming he lost a deal because the buyer didn’t have money, find out what led to that assumption. Teach them to go deeper. 7. Why do you think that happened? 8. What could you have done differently? Give your sales rep a chance to do a post-game review, and give her an opportunity to be a leader who analyzes the process to figure out what went wrong. Help them take ownership so they’ll find a better option next time around. If your seller tells you that a prospect is ready to buy, ask him why he believes that. If he tells you what he believes the customer’s issue is, ask why he believes that. Teach your team the 5 Whys to get to the heart of every issue. 9. What do you need to do to achieve this? 10. What are you willing to commit to? During a one-on-one meeting, when a rep tells you her goals, ask for the long-term strategy that will get her there. Help her realize that she may have to come in early or work late to accomplish the goal. She may have to be creative. 11. When should we reconnect to see if you accomplished this? Just as we follow up with our customers, we must follow up with our sales reps to make sure they are on track. If we check in regularly, we can keep them from straying from their mission. 12. What will keep you from your goal? Help your sales reps anticipate the obstacles they might encounter. Especially when they report crazy numbers they are trying to achieve, help them be realistic by guiding them to predict struggles they might encounter. 13. Which metrics or KPIs are you working on? When you know what your sales reps are working on, you can identify the places they excel. If one rep excels in prospecting and another excels in demos, put them together so they can help each other in the weaker areas. 14. What did you learn from the deal you lost? We all fail sometimes. It doesn’t mean we’re a failure. It simply means we have some learning to do in one particular area. When we honestly address the core challenges, we can truly learn from our mistakes moving forward. 15. What successes did you have this week? We need to celebrate wins with our team, but it seems that not enough sales managers do this. They need to know that we value their wins and that we care about their careers and their progress. They need to get wins and then celebrate them. When you can teach your team to take ownership of the sales process, they’ll have more buy-in and they’ll be more committed to success. When the team knows that you’re invested in their success, they’ll feel valued, and it will create the same bond that it does with a traditional customer. Keep an open mind and an open door with your sales reps so they’ll feel comfortable coming to you. The Sales Evangelist Hustler’s League is our online group coaching program designed to help sellers who have been selling for years as well as those who are new to sales. Last semester, we focused on building value, and we’re beginning a new semester in the fall. To find out more or to apply, visit the Hustler’s League. If you’d like to learn more about video and how to include it in your sales process, check out the Video Jungle podcast, your source for marketing and selling your brand using video. Plan, create and share your way to better content and strategy. You are a brand, and video can help you set yourself apart. Leave us a comment about the questions you use when coaching your own sales team. The book Stop Selling & Start Leading: How to Make Extraordinary Sales Happen from our sponsors at Wiley provides a fantastic blueprint of all the things buyers say they expect and want from sellers. I’m offering a free excerpt of the book so you can learn how to sell by leading rather than supplicating yourself to the buyer.